Sir Jayantilal K. Chande was born May 7, 1928 and passed away April 6, 2017. Born in Kenya, Andy, who was knighted by Her Majesty Queen Elizabeth II in 2003, was a fellow of the International Academy of Management and of the Chartered Management Institute, England. He had an honorary doctorate in Business Administration from International Management Centres, England, and a Consulting Fellow of the World Innovation Foundation (International Multi-Disciplinary Research Group). He was also a member of the Conference Board, New York, and of the Stanford Research Institute, Menlo Park, California. A former Member of Parliament in Tanzania, he had served on the country’s Executive Council – the highest governing organ. He had served either as Chairman or as a member of the Board of Directors of a number of private and public companies and of government and multi-government corporations including East African Railways Corporation, East African Harbours Corporation, Tanzania Harbours Authority, Air Tanzania Corporation and Tanzania Tourist Corporation. He was Chairman of Tanzania Railways Corporation and of Barclays Bank Tanzania Limited. Andy was advisor to the Ministerial Committee of the Organization of African Unity dealing with the Arab League on the oil crisis. He was the deputy leader of Tanzania’s delegation to the UN Preparatory Committee for the Rio Conference on Environment and Development. He was elected to serve as the coordinator between the countries in G77 (and China) and G7 on fiscal environmental facility and participated in the Rio Summit. Andy was a Board Member of the Muhimbili National Hospital – the largest teaching Hospital in Tanzania and Founder of a school for deaf children in Dar es Salaam. He was actively associated with many other educational, social and welfare institutions. Andy is survived by his wife Jayli. They have three sons and three grandchildren. 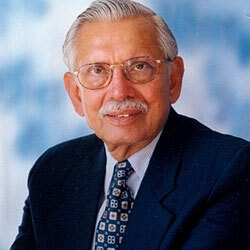 To read more about Jayantilal Chande, visit his personal site.